Convert Word to PDF in batches. 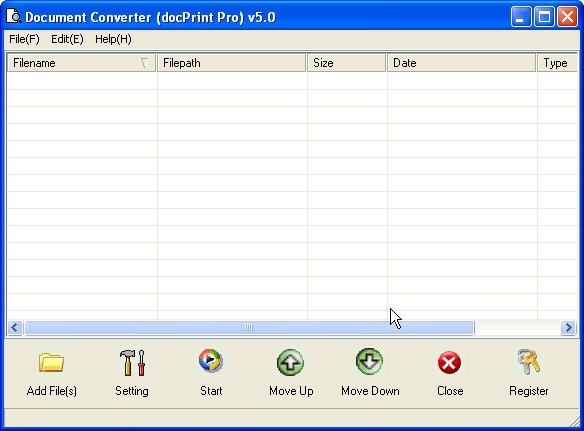 In this article, I will show you how to do the conversion from Word to PDF in batches by software Document Converter. If you have Adobe installed in your PC, you can ignore this article or else it will be helpful for you. Allow me to introduce Document Converter by some words. It either can be used as a file format converter or can be used as a printer driver. It is also a combination of the GUI version and CMD version. In this article, I will show the conversion by its GUI version. First of all, we need to get one copy of this converter to your PC. Here is the downloading link for you, http://www.verypdf.com/artprint/docprint_pro_setup.exe . If you need to know more about it, you can visit its homepage, link for you, http://www.verypdf.com/artprint/index.html. When you download it successfully, there will be an icon on the desktop, double click it then you can get this converter started. The following picture is the snapshot of its interface for your reference. Add files needed converting to this converter. As we need to do the conversion from Word to PDF in batches, we can add the word documents in batches. Here are three ways for adding files for you to choose. 1. Pick up files needed converting together and then drag all of them to this software interface. 2. Put the files to be converted in some folder then add this folder to this software. This step can be processed by pressing the option “File” on the top then go to “Add Directory” option. 3. Click the button “Add Files” to browse the containing folder then add files. Choose the output file format as PDF in the “Base setting” tab where you can enter by clicking the button “Setting” at the bottom of the software interface. Please ignore the second tab named “Save image mode” which is related with the image file formats. Then you should browse other tabs one by one. They are all about the PDF file format. 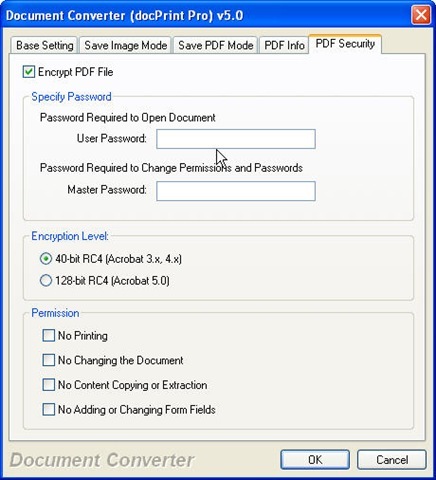 Say you can add information, set password or others for the PDF files. As to check the details, the following snapshot maybe can help you. Al the setting has been done; you can click the button “OK” to back to the main interface to continue the conversion from Word to PDF. Please click the button “Start” to choose the output folder. Once you finish the choosing, the conversion will be run immediately. Maybe a few seconds later, you can use the converted PDF files. Here is the end of the conversion from Word to PDF; this way can also be used to convert all the printable file to image file or PDF file. Thanks for your reading. How to convert DOC to PDF via command line? How to convert documents of HTML to PBM? How to convert documents of Microsoft Office PowerPoint to WMF? How to convert MS Office Excel to bmp using Document Converter? This entry was posted in docPrint Pro and tagged in batches, word to pdf. Bookmark the permalink.